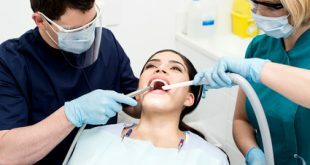 Becoming a dental assistant is a great career choice, especially for those who would like to work in the field, but don’t wish to spend years in school to become a dentist. Dental assistants that treat patients spend their day in a well-lit and incredibly clean environment. They must always wear gloves while treating patients, and depending on the procedure, they will wear masks and protective clothing in order to protect themselves and their patients from infectious diseases. Educational requirements differ from state to state. Some assistants can gain employment with a high school diploma and receive on-the-job training, while others need a more formal education. Most of the programs are offered at community colleges and take about one year to complete. Students will learn about gums, teeth, the jaw, how to use dental equipment, and much more. Depending on the program, either a certificate or diploma is earned. Those that learn on the job will usually be taught by another assistant, but at times, the dentist will teach as well. Training includes dental terminology, how to interact with patients, and the names of dental instruments. Attention to detail – This is very important because dental assistants need to make sure they are always following proper protocols while treating patients and sterilizing instruments. Listening skills – Assistants must be able to work and follow directions from the dentist at the same time. Interpersonal skills – It’s helpful to be upbeat and friendly at all times to patients, especially to those that are afraid or in a lot of pain. Organizational skills – Organizing is important in any career, but especially this one because correct tools must be in place for treating patients, and patients’ charts need to be properly filed. According to the U.S. Bureau of Labor Statistics, there should be more than 74,000 new openings for dental assistants up to the year 2022. That’s an employment growth of nearly 24.5% percent, which is higher than the average for most other professions. If you would like to learn more about this career, we can help. Contact us today. Next What Training is Required to Become an Ultrasound Technician?